… And The Hoosier Scoop has photo evidence. 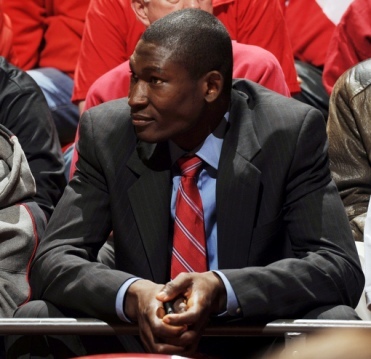 He would have been the second best dressed man on the Hoosier bench last night (behind Tim Buckley, of course.) And in case you missed it in the game recap, here’s the Scoop’s Q & A with Bawa. He could even give Steve Lavin some competition. Everybody's crazy about a sharp dressed man. Bawa referred to it as “our” last game…he's already think like he's a Hoosier. I like that. Props to his incoming class…he said all the right things. He's either got a great PR guy in his corner or he's as smart as he is sharp dressed. Real men take shots – and sleep with the toilet. I guess that doesn't make a great song. Ahhh Bawa arrives…NICE….Head Teague was there too…..interesting to say the least…on a side teague note, I have heard he has taken a real leadership role on his team this year as they have had some internal issues….so I will give the kid some credit as I have been tough on him…. Ahhh Bawa arrives…NICE….Heard Teague was there too…..interesting to say the least…on a side teague note, I have heard he has taken a real leadership role on his team this year as they have had some internal issues….so I will give the kid some credit as I have been tough on him…. I know Bawa personally, and he's handsome inside and out. He'll be a great addition to the Hoosier team. i was living in Ghana as a Liberian Refugee.anyway,i made it possible for him to travel to the U.S.but no one knows my name.Again Muniru you have my blessing and may the Lord protect and guard you through.